Our commercial grade aluminum picnic tables are recognized for their durability and lightweight qualities. Perfect for a wide variety of outdoor locations such as schools, ballparks, and playgrounds. Aluminum picnic tables do not rust making them perfect for prolonged exposure in any climate. These commercial picnic tables are manufactured with lightweight anodized aluminum planks combined with our galvanized steel walk- thru frame ensuring they will last for years to come. All of Picnic Furniture's commercial aluminum picnic tables are proudly built in the USA with a 1-year warranty provided. Aluminum picnic tables are a durable and economical choice. Aluminum picnic tables ship un-assembled and at a reduce shipping cost due to the lighter weight. Assembly is easy and the steel tubular frame built to last for years. 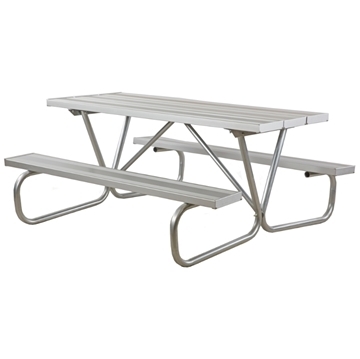 Aluminum benches can be purchased to match these practical picnic tables. Picnic Furniture keeps aluminum picnic tables in stock for quick shipping to locations nationwide. Aluminum Picnic Tables are light weight and cheaper to ship! Save on shipping by ordering in quantities at Picnic Furniture.